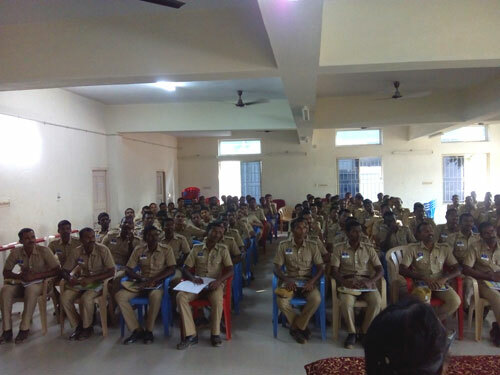 The Police Training College at Ashok Nagar invited MOHAN Foundation to conduct an awareness program on Organ Donation on 1st February 2019 for the cadets in the police training. Mr. Siva Shankar (Helpline Executive, MOHAN Foundation), Ms. S V Ajitha and J Keerthana (Interns from MMM College of Health Sciences) from the Foundation coordinated the programme. The session which began around 4.30 PM was attended by 150 police training cadets. 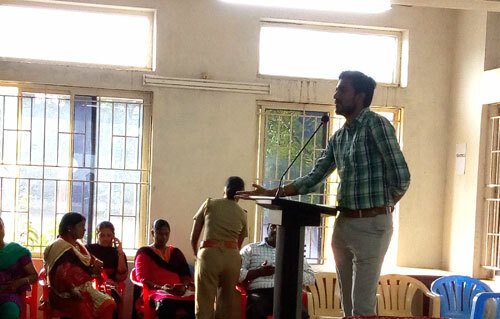 Mr. Siva Shankar in this talk spoke about the concepts of organ donation, difference between coma and brain death, the organs that can be donated, the time factor in organ transplantation from a donor to a recipient, introduced the donor card, the helpline number. He also explained the role of police in an organ donation scenario. What is the difference between natural death and brain death? What are the organs and tissues that can be donated after natural death? Do details of the donor get disclosed to the recipient’s family? How will my family members know that I am a registered organ donor? Nearly 35 cadets registered as organ donors and received their donor cards. MOHAN Foundation staff was felicitated at the conclusion of the programme.